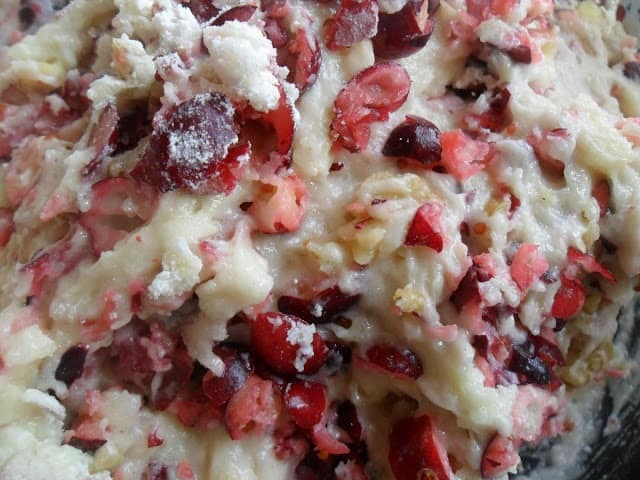 This delicious recipe for Cranberry Nut Swirl Bread is from a Pillsbury recipe booklet that I bought in 1988. We have been making this bread ever since. 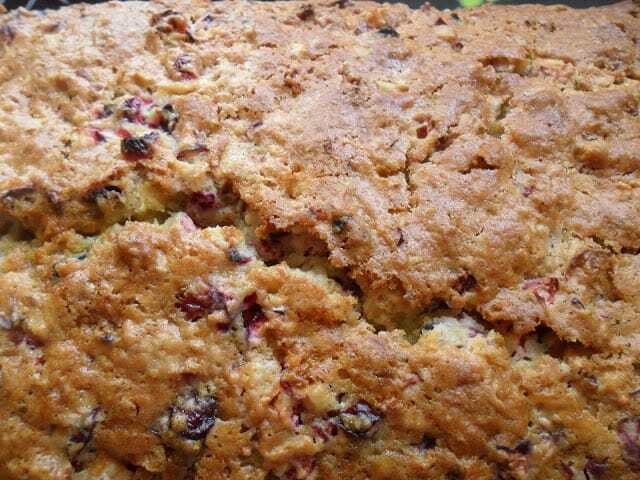 Every year, when cranberries are in season I look forward to making this bread. 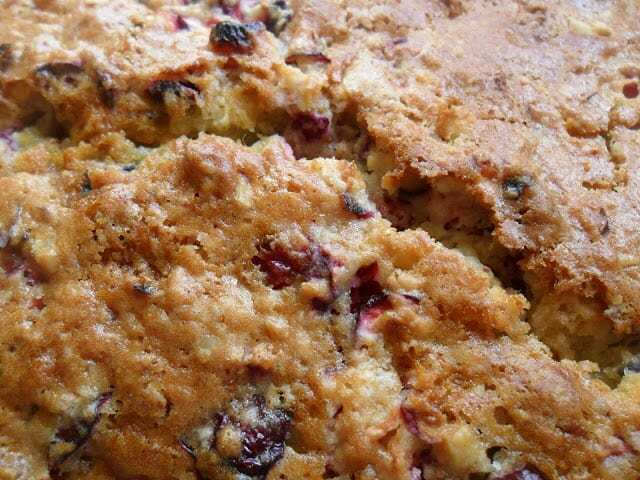 It is by far my favorite quick bread recipe. 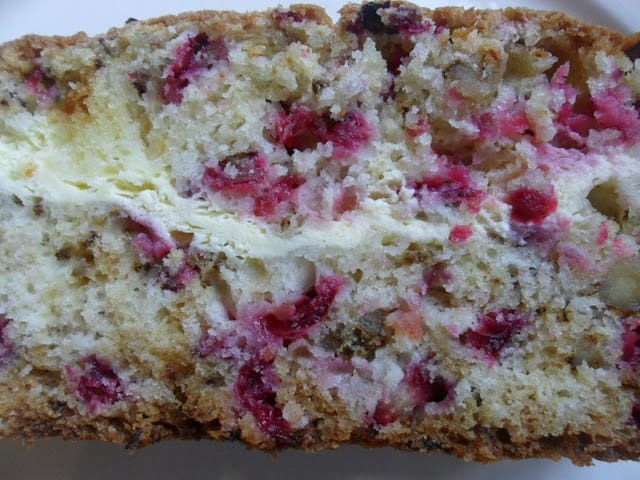 This bread is packed full of cranberries, walnuts, orange zest and a special swirl. The ‘swirl’ part of this recipe is cream cheese. How good does that sound! 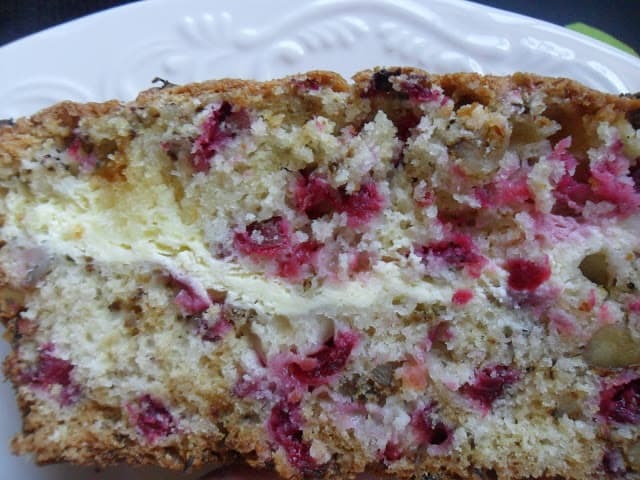 Cranberry nut swirl bread is super moist and delicious. It’s perfect served plain or with a light smear of softened butter. There is too much batter to bake in an 8 x 5-inch loaf pan so you’ll need to bake this bread in a 9 x 5-inch loaf pan. After the bread has cooled completely, wrap in plastic wrap and refrigerate overnight. This makes the bread easier to slice. This bread is best stored in the refrigerator due to the cream cheese swirl. 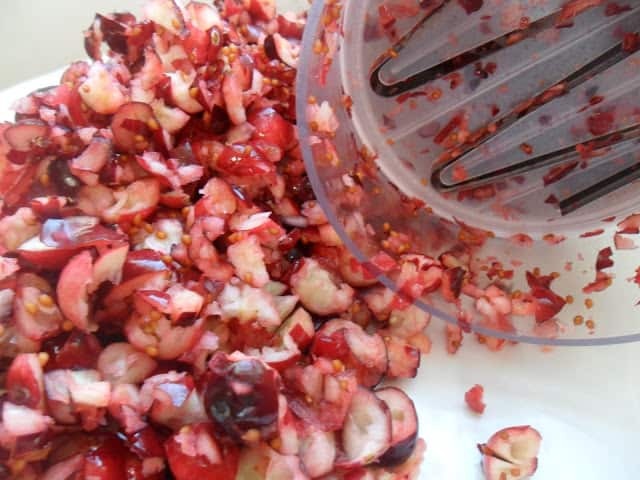 Cranberries are shiny scarlet berries, that are grown in huge sandy bogs and grow on low trailing vines. Cranberries are sometimes called bounceberries because the ripe berries bounce. (I can attest to that fact because I’ve ‘bounced’ cranberries on my kitchen floor) Craneberries is another name that cranberries go by. Named after the shape of the shrub’s pale pink blossoms. These blossoms resemble the heads of the cranes often seen wading through the cranberry bogs. This bread has been a favorite in my house for many years. Heat oven to 350º Grease and flour 9 x 5 loaf pan. In small bowl beat cream cheese until light and fluffy, add egg, blend well. Set aside. Lightly spoon flour into measuring cup, level off, in large bowl mix together flour, sugar, baking powder, baking soda, salt and orange zest. Stir in apple juice, butter and beaten egg. 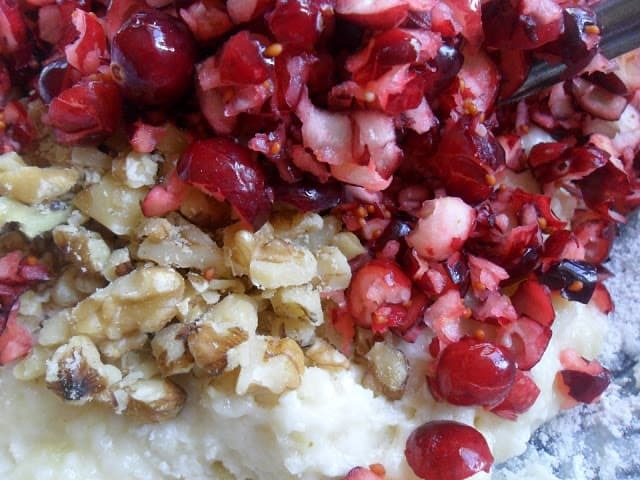 Fold in cranberries and nuts. Spoon half of batter into prepared pan. 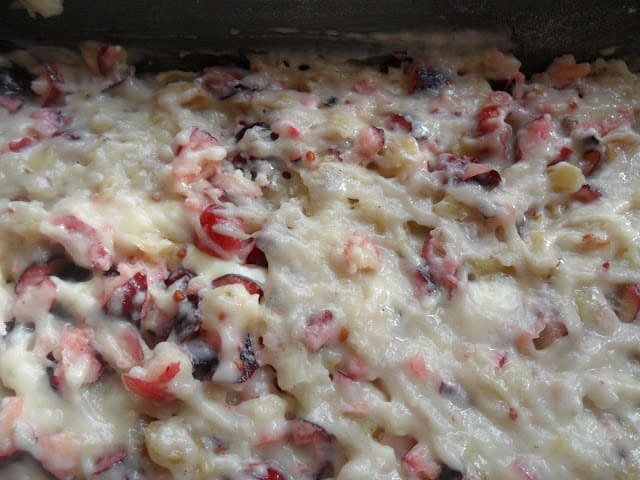 Spoon cream cheese mixture evenly over batter. Top with remaining batter. Bake at 350º for 65 to 75 minutes or until toothpick inserted near middle comes out clean. Cool in pan for 15 minutes. Remove bread from pan. Cool on wire rack until completely cool. Wrap bread tightly in plastic wrap. Store in refrigerator overnight. Slice bread the next day. Hungry for more Bread Recipes? Here on Turnips 2 Tangerines we love our quick bread! Cranberry Orange Marmalade Bread, Double Chocolate Cherry Friendship Bread and Garlic Herb Bubble Bread.